During the holidays, food does not have to get in the way of maintaining your weight loss. In fact, a healthy diet can actually help maintain weight loss. There are many tasty foods that are also beneficial to your health. 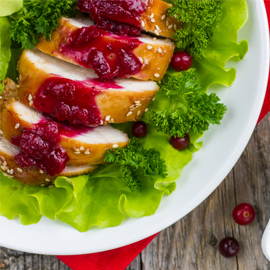 Foods such as turkey, potatoes, cranberries, pumpkins and pomegranates offer a flavorful yet healthy variety to your holiday feast. Having turkey for the holiday meal does not mean it is high in fat. By basting the turkey yourself, you will know that it has not been injected with extra fat. When eating potatoes it is important to remember to not peel the skin. Even though potatoes are fat free, the skin offers extra nutrients and fiber. Cranberries are packed with natural antioxidants, which reduce cholesterol and improve heart health. They also help reduce the chance of urinary tract infections and gum disease. Pumpkins and pumpkin seeds are both rich in nutrients. Pumpkin is packed rich with nutrients like vitamin A, vitamin C, and lycopene. Pumpkin seeds contain protein, fiber, and zinc, which also makes them a nutritional snack. The ripe juicy seeds of the pomegranate make this an easy treat to enjoy. The juice from pomegranates promote heart health by being packed with antioxidants. By incorporating these colorful, flavorful, and healthy foods into your holiday meal, eating through the holiday season does not need to be feared. Low fat or low calorie foods can be just as delicious, but a more healthy alternative. Also, by having these healthy foods instead of foods that contain empty calories you can help ensure that you maintain your weight loss. What is the Best Diet for Diabetes? Are Testosterone Supplements for Men Safe?